Or How Our Lives Have Changed! As another Fourth of July appears upon the horizon, your author has been engaged in a bit of nostalgia. The Fourth was once one of the primary celebrations among those of us in my core family – MomMay, DaddyJack, sisters Mary, Noralee, and Jacquie. Often there were parades with bands and floats and colorful costumes and fireworks. At home, there were always big meals featuring homegrown produce, favorite family recipes, and more fireworks. These celebrations were accompanied by lots of joyful conversation, more family members congregating along with friends and neighbors, many times featuring stories of other times, other celebrations, other meals. Such was the fabric that made up the patchwork of memories. Now, family members are spread miles apart – those that yet walk upon this earth - with so, so many having passed beyond the veil. And on this nostalgic note, I find myself pondering how very much times have changed. Back in those days of yore, I was a youngster far too involved in the NOW, the present, the excitement of sparklers, marvelous displays of fireworks loosed by the various hometown groups offering magnificent shooting stars and cascading trails of light against the starlit sky. The stories shared by the older family members about their lives and their parents, cousins, siblings provided merely a background white noise to the excitement of my own little world. On this day, looking forward to our next Independence Day events, I can only wish I had listened more closely, shown more appreciation for the wealth of knowledge being offered. And I yearn for my own children and grandchildren to surround me with their love and their youth – and, of course, for them to have an appreciation for the stories of our ancestors. Communication. The means by which oral traditions are handed down. The method by which generations from time immemorial have learned about life, about tradition, about recipes and songs and stories and courageous acts and heroes walking among us. This brings my thoughts back to how very much communication plays a role in genealogic research. My sisters and I were blessed by having been born in a family of folks to whom tradition and lore played a huge role. Although the ways in which maternal and paternal grandparents imparted their knowledge differed, both provided marvelous glimpses into our ancestral heritage and clues for pushing our research backward, ever backward, in time. As researchers, my sisters and I were blessed by a wealth of handwritten information from family historians who treasured the knowledge with which they had been endowed. Many of our stories were handed down to us because our grandmother, mother, and aunt on my Mother’s side were prolific letter writers. Especially my Grandmother Joslin who carried on multiple daily pen pal exchanges with dozens of family members scattered about the world as well as friends and neighbors whose lives had carried them away from the hometown. In the days before instant communication by Messenger on the Internet, even before the slightly more lasting communication via email, these letters comprised inquiries about the health of family members, celebrated new life (giving valuable information about date, place, and circumstance of births as well as names), imparted wonderful color about crops, weather, prices of goods and the personal impact of historical events. We were gifted with many a copied (handwritten copy or photocopy or retyped copy even) transcript of these family treasures. Our own digitized family tree evolved as a result of my sisters Mary and Jacquie reading to me (as I entered the data) from the three primary sources of family lines: The Bullard, Godwin, and Hopper maternal lines as compiled by their respective family historians. We first entered the names of our core family, then branched back using these photocopied materials and painstakingly entered dates and locations (where available) for births, marriages, and deaths. Only after we scoured the materials for these basic facts did we permit ourselves to delve into the STORIES that accompanied some of the profiles. Profiles in courage – absolutely – and the source for my own growing passion to KNOW about these people whose blood courses through my veins! For it was only with the introduction to the day-to-day lives of these ancestors that my interest was piqued. And the more I delved into the process of matching the stories with the facts the more my interest grew. As the years passed, more and more of these family historians have joined our ancestors in their walk into eternity. More and more of their knowledge has been lost, and more and more I value what is left of their contributions. 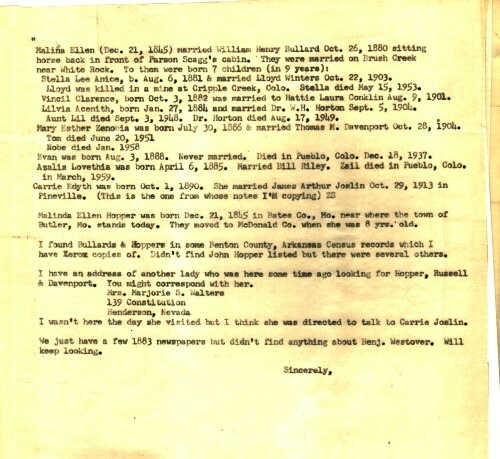 My maternal aunt, Linnie Jane Joslin Burks, was invested with her love of genealogy at an early age – thank Goodness! She engaged in a time-honored method of interviewing the elders of the family to capture their memories. Aunt Linnie Jane did not seek to guide their recollections, merely strove to jot down the very words they used to tell their stories of childhood memories or family lore that had been passed down by word of mouth to them. After her death a few years ago, her husband, Dr. Edgar H. Burks gathered all her treasure trove of letters, notes, relics, and boxed them with the intent of shipping them to your author for safekeeping. Somehow, that never happened. But, recently, a cousin posted copies of some of those treasures she had found in the local McDonald County, Missouri library. It is my hope and prayer that all those treasures were, likewise, donated for preservation and will be made available to researchers from now on. 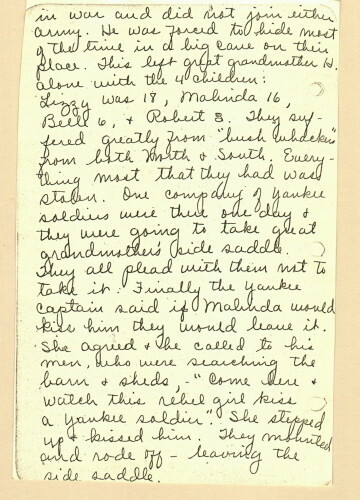 Thus, the first example comes to mind of how science and technology has impacted genealogical research: from personal interviews with elders where their memories were captured by hand on notebook paper or diary to the wonders of the Internet where such documents are made available to all by virtue of another advance in technology: the scanning machine that digitizes images and creates a virtual image! How incredibly marvelous! The caution here is, as always, to appreciate the story, capture it, digest the story, but always check the facts if at all possible. For these memories are much like the old game of Gossip, where a circle of friends shares by whispered utterances the “same” story until, once all have had an opportunity to put their own spin on the knowledge they just gained, the last link in the circle recites his or her own version – often completely unrecognizable from the little tale first offered. 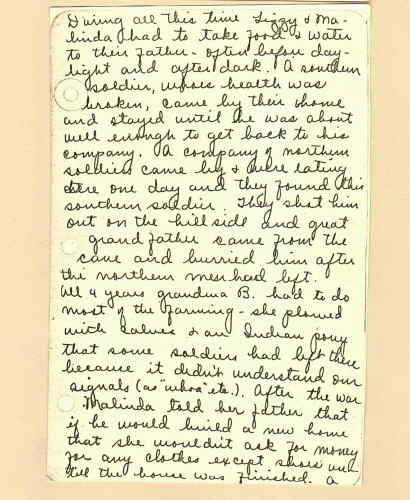 This is illustrated for your author by the story handwritten below in the document shared recently on Facebook in one of the family history groups devoted to our Hopper line. 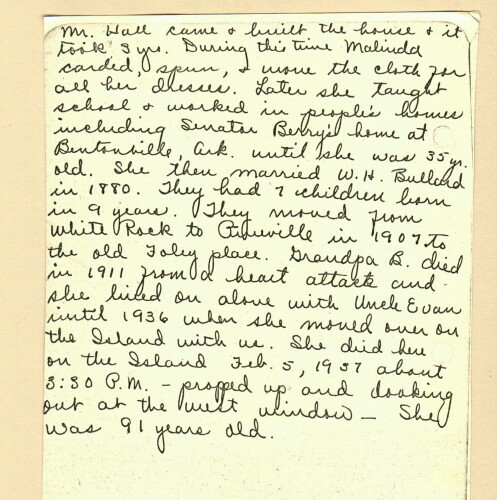 The story related by this ancestor regarding events during the Civil War somehow conflated details related directly to me by my grandmother regarding the same incident. 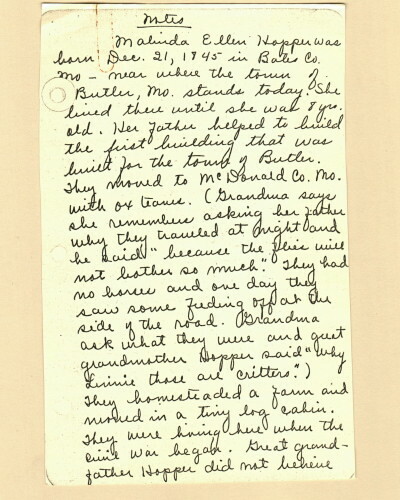 In the handwritten “memory” preserved in the library, Great Grandmother Malinda Hopper Bullard saved NOT the farm from being burned (as was the story told by her daughter, my grandmother, to me) but – only a sidesaddle. In the story related to me, Malinda did indeed ride sidesaddle, but that saddle played no part in her paying a “Yankee dime” and a tart response that saved the family farm from being burned as were most in that area. Memories – gossip – details lost or mixed up in the telling. Regardless, the memories are priceless. In the same way technology has changed our lives and our research with regard to direct communication, it has also changed the way in which we preserve concrete (or marble, or granite, or…whatever material one’s ancestors headstones are made from) information gleaned from the final resting place for those beloved ancestors. As has been related in an older column, our Grandmother Carrie Bullard Joslin was an avid family historian and a generous sharing person. Her favorite little picnic hike involved carrying tracing paper and chalk as well as graphite leads and manilla paper to the graveyard, along with a tasty lunch. She would walk the graveyard, carefully preserving the headstones and markers (tracing paper and chalk for the bas relief, manila and graphite for the raised lettering), then spraying the tracings with preservative, rolling carefully into tubes and using wrapping paper rolls to transport them to the local library. There, these priceless bits of information would be carefully typed into listings for each cemetery or private burying place and stored for future historians’ research. Now, devoted researchers trek to the cemeteries and overgrown family plots with their GPS devices and smart phones equipped with digital cameras. They carefully notate the complete location information and share the disappearing data with the world through such websites as Find-A-Grave and its similar ilk. Another example of how science has affected our research methods lies in the proliferation of social media sites, which take the place of personal handwritten communiqués (termed “snail mail” by our youth). Facebook and Twitter and similar Internet gathering places offer space for individual pages or formation of special interest groups (such as that above where my Aunt’s handwritten pages were shared by another cousin on the Hopper group page). These gigantic social gathering places offer Search methods that permit one to locate a person, a page, or a group in their quest for family tree information. As exemplary evidence, your author has engaged in extensive research for many, many years to solve a few mysteries in our family line created by closed adoptions or even by family secrets. One such mystery involves my first husband who always believed he was not the biological child of his mother and the man who gave him his surname, but had been adopted as had been his younger sister. Through the wonders of DNA combined with the miracle of the Internet and social media, we recently discovered this to have been true. My grandson, a direct line descendant of my first husband, consented to provide his DNA sample. Shortly after the results were posted, I was contacted by a beautiful young woman who had been seeking her biological father. Their DNA match left no question but that my first husband was, indeed, her bio father. He was a magnificently handsome man with a troubled and painful past brought about by the family secrets that clothed his own identity in a cloth of tangled lies. Through his yearning for family, he endlessly sought that perfect family – a family perfection that could never be found. We are in contact with this lovely young lady – a woman who shares a striking resemblance to my daughter, her half-sister. We are blessed by this miracle! This young woman has also engaged in her own research and, through her contacts, we now have the name of the biological father of my first husband (who has, sadly, passed on before this information could be shared with him). We shall continue, in concert, to seek the biological mother and, thus, round out the essential family line that will provide future generations with truth rather than clouded mysteries for his descendants. Similarly, a search for the biological family of my granddaughter-in-law has succeeded in finding her full siblings, her biological maternal grandmother, and her biological father. In this instance, DNA from her test results coupled with extensive decade-long research via typical genealogical sources by your author provided a means to search from generations back down through the vital document trail found on Ancestry.com. After confirming our long-held belief as to the identity of her closest in age sibling, we were able to actually locate her through Facebook. The sisters have now been able to share (as sisters should) with photos of their children, facts of their lives, and their continuing love for one another. This link is proven by DNA, by memory, and by documentation. Amazing! Other mysteries remain to be solved. For your author, the two brick walls that comprise our greatest frustration are, maddeningly, connected to the direct lines of Carroll and Joslin! We shall continue to utilize all avenues available to us to chisel away and, hopefully, some day, break down those walls to provide our future generations with truth and light rather than mysteries and secrecy. As always, you are encouraged to keep on adding leaves and roots and branches to that Family Tree!